The establishment of Medoks s.r.o. (LLC) in 2007 was inspired by our love of baking, quality desserts and original recipes. 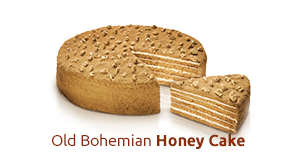 The Old Bohemian Honey Cake was thus a unanimous choice, the rightness of which is continuously being comfirmed by the ever growing number of our customers who share a passion for this honeyed gem. 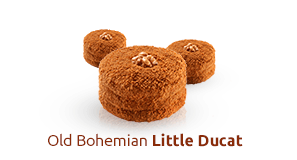 We are very pleased that the renown of Old Bohemian Honey Cake has spread across national borders and become a sought-after delicacy in other member states of the European Union. Since we in Medoks s.r.o. value the loyalty of our customers, we like to annually reward them by introducing an unorthodox flavour or a completely new product. Each honey cake is made with love and maximum care and every bite is made of not just the fresh, premium ingredients, but also our wholehearted wishes that you enjoy it. History of honey pastry dates back to the distant past. honey cake men knew each other in the Mediterranean. In ancient times, honey honey cake played an important role in ceremonies and served as a sacrificial bread of the ancient Greeks. 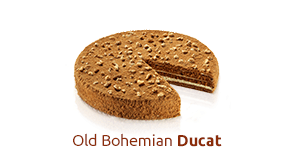 In Bohemia honey cake popped up in 1335 in Trnov, where they later spread to all corners of the Czech lands. In Prague, the production of honey cake came about in 1419, when, 18 honey cake shops. Recipes were very top secret, passed down only from father to son. These delectable delights are designed primarily to higher social classes..
For a delicious and very special taste of honey pastry was used for the production of various types of candies and became the basis for the now very famous honey cake . Staročeský honey cake combines a very subtle taste of honey slices and two kinds of cream. With a delicate harmony of flavors has won the admiration of even the most demanding gourmets. 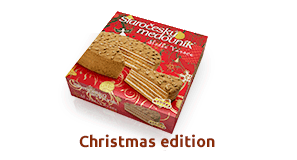 Staročeský honey cake is made by hand and contains no preservatives , is made solely on natural ingredients. They must be stored at 0 ° C to 6 ° C for up to 21 days. When freezing from -18 ° C to -25 ° C retains its quality even in three months . 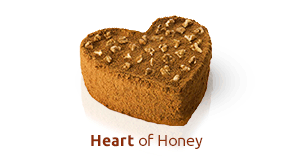 Classic Staročeský honey cake weighs 1750 grams , but if you want a smaller , produce small honey cake weighing 700g. In STAROČESKÁ honey cake contained very beneficial ingredients - honey and walnuts . Since ancient times, honey is attributed to exceptional healing properties. For example, in ancient Indian medicine , it is stated that it can prolong life by up to 500 years with a special diet , which consisted of honey and milk. Honey has been considered a food of the gods , and played an important role in religious ceremonies. It has always been known as a true elixir of youth. Honey is used to treat respiratory problems , but also has antiseptic properties - in ancient times it was believed that helps to heal wounds. Reportedly, it is also a mild sedative. Walnuts have been grown in Mesopotamia in the famous gardens of Semiramide , which was roughly 2,000 years BC They are a source of vitamins, iron , copper , zinc, selenium , magnesium, protein and other essential substances . They do not contain cholesterol. Medoks Company Ltd. was established in May 2007, but in that short time he managed to carve out a unique place in the Czech market. And only through hard honest work and of course quality and unique taste of Old Czech honey cake.